The U.S. Senate Majority Leader announced his plan to introduce legislation to legalize hemp as an agricultural commodity under federal law. 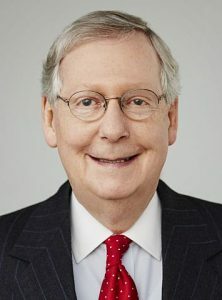 Senate Majority Leader Mitch McConnell (R-Ky.) announced today that he would soon introduce a federal bill to legalize hemp as an agricultural product. The Hemp Farming Act of 2018 would distinguish hemp from marijuana and remove hemp from the list of controlled substances under the Controlled Substances Act. If approved, it would allow hemp to be sold as an agricultural commodity. The bill is being co-sponsored by Sens. Ron Wyden (D-Ore.) and Rand Paul (R-Ky.). At today’s press conference with Kentucky Agriculture Commissioner Ryan Quarles, McConnell said he intends to introduce the bill when he returns to the senate in a week. “Hemp has played a foundational role in Kentucky’s agricultural heritage, and I believe that it can be an important part of our future,” McConnell said in a statement. Kentucky, among the leading industrial hemp-producing states in the U.S., is currently conducting a hemp pilot program through the Department of Agriculture. A team at the University of Louisville has been growing hemp and studying its viability as a biofuel and energy source since 2016. “Here in Kentucky, we have built the best Industrial Hemp Research Pilot Program in the country and have established a model for how other states can do the same with buy-in from growers, processors, and law enforcement,” Commissioner Quarles said at the press conference. Return of Hemp to the U.S.? The farming of hemp has a long history in America, but since 1970 has been prohibited federally after all forms of cannabis were blanket-banned under the Controlled Substances Act. Since 2014, Section 7606 of the Farm Bill — signed into law by Barack Obama — gave authorization to state departments of agriculture and institutions of higher learning in states with legalized hemp to grow the crop for research and pilot programs. More than 30 states have taken advantage. With commercial hemp cultivation remaining illegal, the nation’s estimated $688 million hemp market is currently supplied through imports, hindering the economic potential for domestic farmers. At one time, hemp was a significant cash crop for Kentucky, where farmers produced 40,000 tons in 1850. At the press conference, McConnell acknowledged that challenges remain between state-compliant hemp farmers and the federal government. His bipartisan legislation would remove federal restrictions on hemp, allowing states to control their own hemp regulations. According to the press release from McConnell’s office, it would also allow hemp researchers to apply for grants through the Department of Agriculture. McConnell added that he would soon discuss the new legislation with U.S. Attorney General Jeff Sessions, a longtime opponent of cannabis reform. Earlier this year, Sessions rescinded an Obama-era policy that directed federal prosecutors to not prioritize interfering with state-legal cannabis operations. Learn more about hemp and its benefits HERE. Keep up with the latest updates regarding the cannabis industry by regularly visiting our news page.